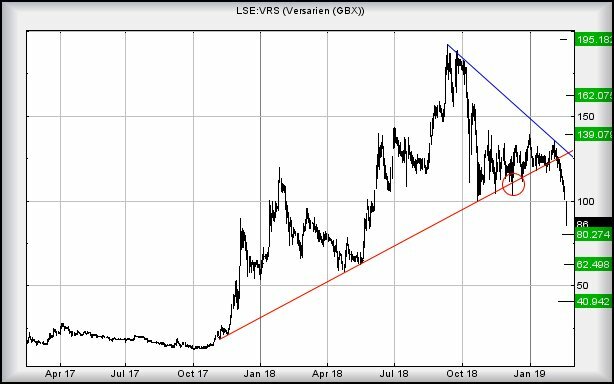 Versarien #Nasdaq #CAC40 We reviewed #Versarien last week (link here), assuming it was going to take time to reverse from 114 down to 87. Recent price moves explained, concisely, why we avoid giving timescales. We’re not Dr Who and a share price can make all the right (or) wrong steps, then shuffle to our target levels eventually, the speed element defying any logic. But generally, it will get there! Now Versarien has achieved both target levels in just 7 days, we’ve been bombarded with requests for an update. It has managed to achieve something quite dangerous by closing the session below our secondary target level. This places the share at risk of moves now below 85 opening the door for travel down to 62p. 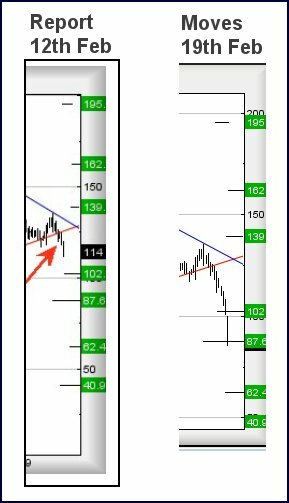 This time, our secondary is quite distant at 40p and a level where it is expected to bounce. Crucially though, there’s a glimmer of hope at the 80p level, a point where we suspect it should bounce fairly soon rather than continue trashing investors hopes. But one iota below the 80p point and 62p becomes best hope for the future. At present, it’s fairly meaningless the point the price requires better to escape this misery. The pace of descent has been so brutal the share actually needs a bounce to exceed 110p just to suggest the immediate downtrend has failed. For now, our best hope in the immediate future will be of 80p producing some sort of rebound.